My grandma is blessed with the most excellent, innate, and timeless style of anyone I have ever known. As I tried on a red knit hat with an oversized flower that I got as a holiday gift this year she said, “It will look better with your hair down.” And it did, of course. At ninety, my grandma has Parkinson’s disease, and very serious memory loss. Sometimes, she cannot remember what has happened in the prior sentence, ending one definitive statement about something with a question about what has just happened. “It was so great to see them,” she says. “Is it just us here today?” She will often remark on the darkness of the night. Again and again. The darkest night she has ever seen. What day is it? Isn’t it dark tonight? What day is it? Isn’t it dark tonight? This is the darkest night I have ever seen. I modify and streamline my answers until my response is honed and perfected. Yes, the darkest night on the longest day in December. She nods. Isn’t it dark tonight? Some number of years ago, and before it came back into fashion, my grandma suggested I purchase a white shag rug for my living room. That was a year or so before everyone started doing it. Her apartment still looks modern, although now some of the paint near the top of the 13 foot ceilings show their age. The rugs are slightly worn, but still lively with color. But the chocolate brown wall in the dining room is still perfect. My grandma has never really worked, she but was the daughter of an immigrant who did. My great grandma was a single mom, before the term had been coined. She owned and ran a successful business when women were thought incapable of it, and later, she bought and managed real estate properties, and her son joined her in the business. Not her daughter. She raised her daughter very carefully. My grandma was excellent pianist, careful not to to play tennis so as not to damage her hands. She was charming. She elevated conversation to an art; you were lucky to be seated next to her at dinner. She knew just how to go to lunch, buy the best presents for friends. She gave lovely dinner parties, dressed beautifully, shopped creatively, wore her hair just right. She was current on art, music, theater, ballet, opera. I still have and love Japanese flower scissors she bought for me from Takashyimaya on 5th Avenue. They are beautiful. She always knew what color to paint the walls. You would still choose the same wallpaper she has in her den (if you could find it) even 42 years later. All this is not to say she was perfect, that she did every thing right, that she didn’t struggle with not having a career, or never becoming a concert pianist, or raising her three children. She was human. I know many people feel that, especially for women, pursuit of excellence in the aforementioned areas is considered worthless, or even demeaning, but for my grandma, it was a life well lived. She seems to be the last of certain kind of person. Her life was her art, and she, the maestro. “It is not easy being a woman in Africa,” says Issac Denison in Out of Africa (played by Meryl Streep). Or any place else for that matter. And the rules of womanhood, femininity, equal rights, equal pay, stay- at-home-moms, right-to-life, when to get married, and many other issues will not be settled anytime soon. I am not convinced anyone knows, well enough, the answers to these questions. When I was 13, she gave me just the right length pearl necklace for a girl that age, with an extra strand to add when I turned 16. You may not have known that there is an appropriate length necklace for a girl that age, but there is. And it does not change with fashion or time. 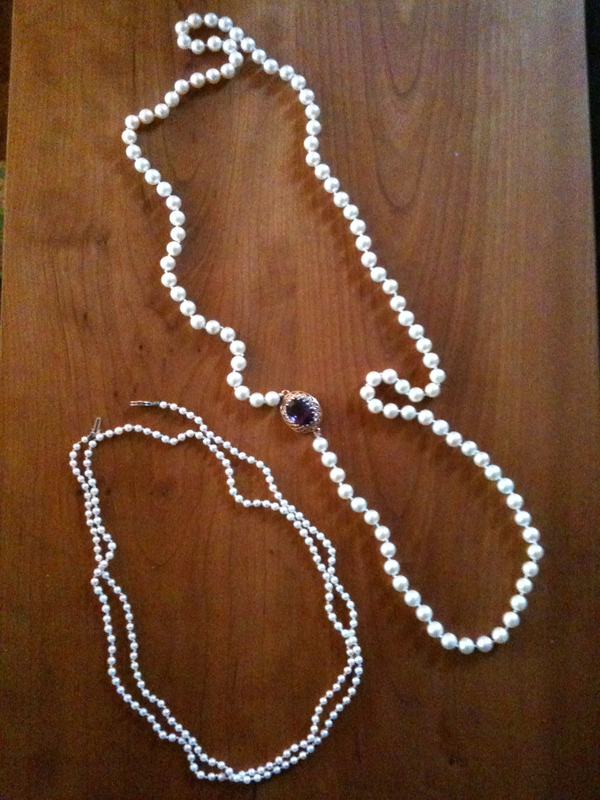 Before she lost too much of her memory, she gave me another set of pearls that had been hers, the grown-up version. She knew many secrets in that magical process of turning a girl into a woman. They have not been lost. She is a kind, wonderful, lovely person, even now, even though she is not who she was. There are still the same moments of grace and kindness and charm in her. When I am in her apartment, there are many memories. Opening the medicine cabinet in the guest bathroom, I remember, many years ago, when I accidentally broke an expensive bottle of perfume. I was horrified, but she didn’t get angry, she didn’t even seem upset. She just wanted to make sure I wasn’t hurt. She got married at 22 and has been married for 68 years. My grandfather is with her still, taking care of her, making sure these final years are okay.